Back when I started my teaching career one of the local runners who completed against my school's XC team was Becky Flowers. Becky went onto run for W&M and graduated in 1998. Today she made the NYTimes for her thesis that the Grand Canyon is much older (70 million years) than originally thought and might have thus been seen by dinosaurs. Thanks to Tim O'Dowd for these pictures from the NCAA meet. 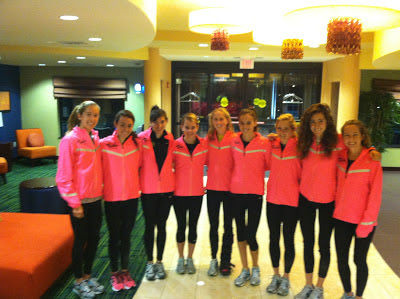 I was going to try to interview Emily and Elaina, but no need now since Flotrack interviewed of them. This interview was taken just after the NCAA meet was over. Elaina says that even she was surprised by her 13th place finish. She also speaks about her spring break through season in the 5K. It should be noted that Balouris has the 4th best finish ever for a female from W&M (finishing above - photo from Let's Run) while Stites is the first frosh to win and All-American title at W&M and was the 4th frosh across the line. 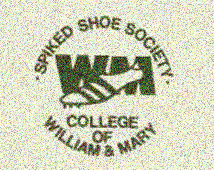 After two years of being dormant we are restarting the Spiked Shoe Society on Facebook. If you would "like us," it will be a way to reconnect with old friends. Definitely post pictures of your family and important events on our wall. If you go there now, you will see a picture of Randy Hawthorne running with the University of Michigan's team and former W&M coach Alex Gibby. Go here at noon EST to watch the women complete at the NCAA Championships. The women left today for the NCAA meet. If you want to see it live, go here on Saturday at noon. I'll put more here prior to Monday. Christo Landry '08 ran 2:17.11 to finish 4th in his debut marathon in Richmond. Landry is now a volunteer coach at U Michigan (where former W&M coach Alex Gibby is coaching). Alex McGrath's 18th place led the men at the Southeast regional this AM with a 30:36 time as the men finished a disappointing 8th overall in the race. This means for the second straight year, after 14 consecutive trips, the men will not be going to the NCAA regional meet. McGrath's placement does mean that he has earned All-Region honors.